Hollywood has a population of about 146,000 people, which makes it a relatively small city that retains a traditional laid back Florida feel. The main attractions in Hollywood can be found near the beach and boardwalk with the rest of Hollywood mostly containing residential housing and small businesses. Hollywood has a tropical climate, the summer being very warm with temperatures in the 80s and 90s (26-38 C), and very mild winters, with temps in the mid-70s (about 23C). 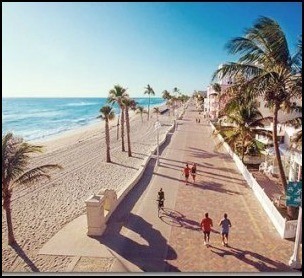 Hollywood, Florida is a great place to live and visit with great entertainment activities and a beautiful beach to enjoy.